I was in the department store near to where we live to buy our Nespresso coffee. The Blue Salon is the only place in Doha where the coffee capsules are available. It also sells an array of upmarket, expensive goods. 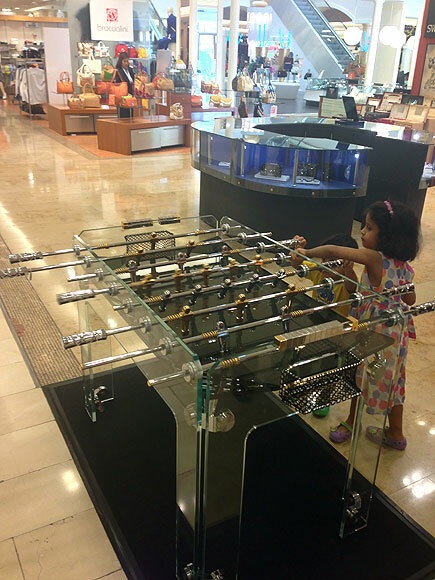 Amongst the watches, handbags, designer clothing and other stuff I am not going to buy is a Table Football table. Built on a perspex base, the teams are kitted in gold or silver. It is yours for the bargain price of 89,800 QR or £16,188. 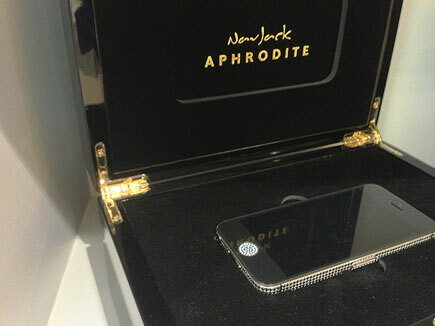 They also sell a jewel encrusted iPhone. I won’t be getting one of these either. 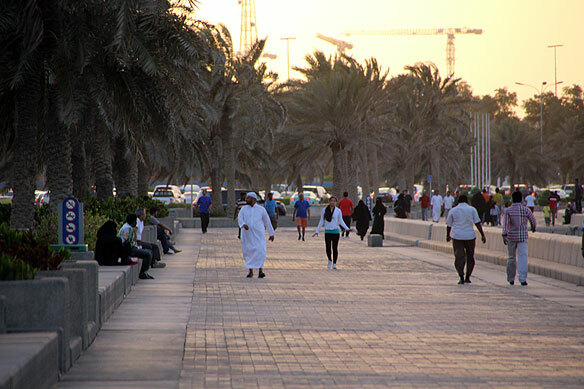 I took my new camera out with me a few days ago for our walk along the Corniche. It’s now too hot to walk in the daytime, but as the light falls, so does the temperature. It is still hot, at around 36-38C, but if there are breezes a 40-50 minute walk is pleasant and not uncomfortable. 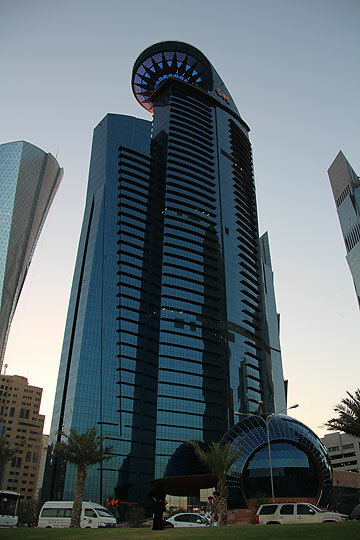 This time our walk took us by my favourite building, Doha’s World Trade Centre. It’s not quite finished and still unoccupied. At the base is a huge glass sphere. 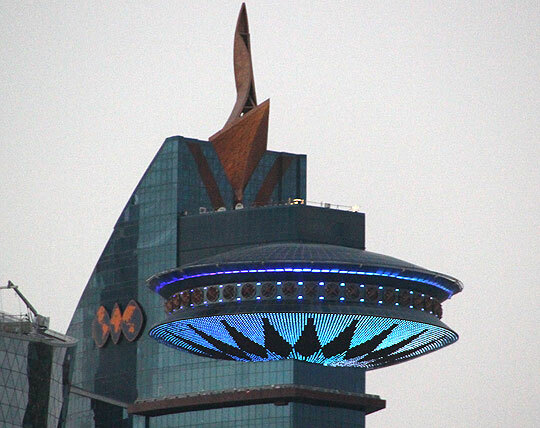 At the top of the building, what looks like a flying saucer that has crash landed gives a nightly light show. Colours change, the patterns vary and ticker-tape messages play. As darkness falls, many of the buildings in the city light up. The views of the Doha skyline look even more spectacular as the light drops than during the daytime. 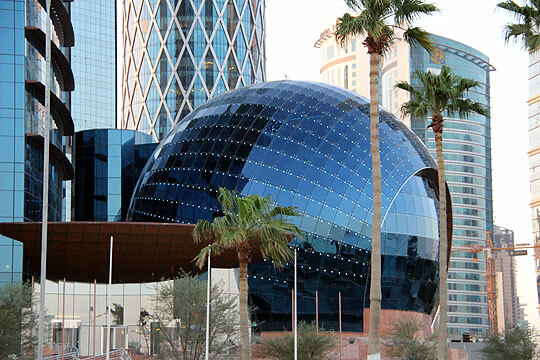 My place of work is the top attraction in Doha according to Tripadvisor. It is also almost always on the itinerary of VIPs visiting Qatar. In early May as I was waiting to get in the lift from our offices, Meryl Streep appeared as the doors opened. 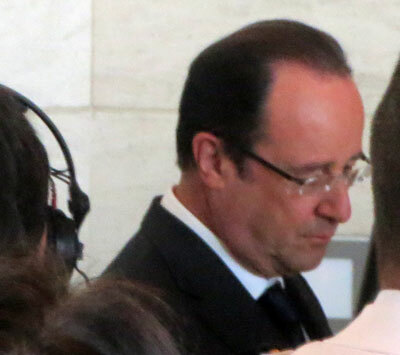 In the last few of months, Boris Johnson, Lionel Messi, Hamid Karsai, and Charles & Camilla have visited, and yesterday it was the turn of the French president, François Hollande. I don’t normally get to photograph these people, but I was able to grab a quick snap as he was leaving the building. 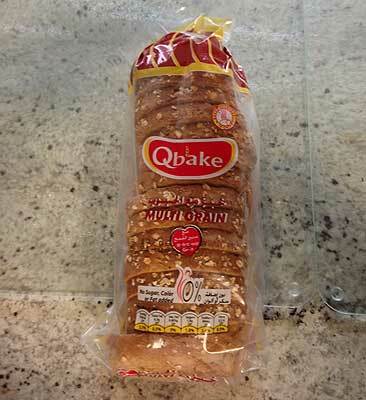 In the UK, the manufacturers of sliced bread do their very best to make the product natural and wholesome. The packaging might show stalks of wheat ripening on a sunny day or a chubby baker in white with smears of flour across his face. 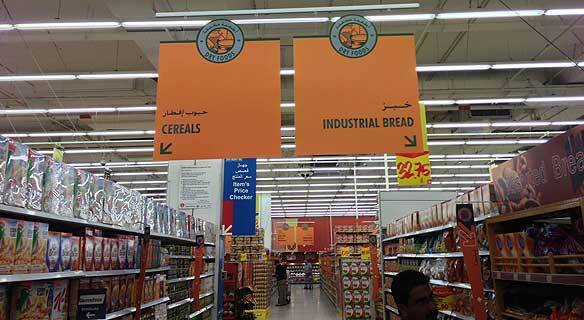 In Carrefour in Doha, there are two sections for bread. One is where we buy baguettes and loaves baked on the premises. The other in the main aisles is where we buy sliced bread, however there is no attempt to make it sound like a natural product. We get stuff sent from the UK using a third party shipping agent. When we buy things by mail order they get sent to a holding centre until we decide we have enough to send them to Doha. The more items we send in one batch, the proportionately cheaper it is per item. We usually buy in batches anyhow so seldom have to wait more than a few days for things to arrive. We use Borderlinx, who I can recommend if anyone wants to ship from the UK to Qatar. DHL is their shipping courier. They also ship from the USA but I haven’t bought any US goods so I cannot comment on this part of their service. Until this week everything has gone well. Something bought online in the UK can be with us in less than 5 days. A shipment of four items left the Borderlinx facility but it was down to three items when it arrived at the DHL facility in Birmingham.The three remaining packages arrived in Doha but were then mysteriously shipped off to Malaysia. They made the return to Doha and were delivered yesterday, so even with the extra trip east, the packages arrived in less than a week. After a few phone calls to DHL the missing package was located and is being sent on. For some unaccountable logistical reason it has overflown Qatar and is now in Hong Kong. If you care to follow its onward journey to me, use this link to DHL tracking. Imagine you are standing in front of an industrial heater while someone is throwing fine sand into the hot stream of air… that was Doha weather yesterday. The temperature was 40C, sand swirled across roads and my car will probably be covered with a fine layer of dust even though it is in the underground car park. We could not see West Bay from our windows. This morning just after dawn the dust had settled, although now four hour later, the view is again obscured. My eyebrows require little care or attention. In more recent years the odd hair needs to be clipped, but otherwise they have always been low maintenance. One of the local styles in fashion and dress is the female eyebrow. Many Qatari women favour highly stylised eyebrows. They are deep black, appear to be painted on, sit slightly above the space where eyebrows should rightfully be, and have square ends at centre of the brow.